Welcome to the worlds greatest guide to Women's Animal Print Pants. Trousers (British English) or pants (American English) are an item of clothing worn from the waist to the ankles, covering both legs separately rather than with cloth extending across both legs as in skirts, and dresses. Textile printing is the process of applying color to fabric in definite patterns or designs. Animal print pants are made to resemble the pattern of the skin and fur of an animal such as a leopard, cheetah, zebra, tiger, spotted hyena, striped hyena, giraffe, or other animal. Different printing techniques can be used to create the graphic design on pant fabrics. Roller, cylinder, or machine printing is most common for larger scale production runs. However, screen printing, digital textile printing, and other methods can also be utilized when adding animal print designs to pants. Apparel Search is a leading guide to fashion, style, clothing, glam and all things relevant to apparel. 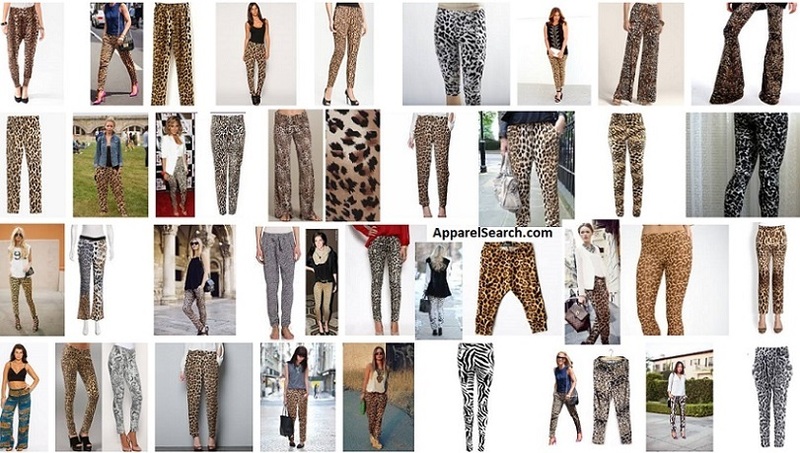 We hope that you find this Women's Animal Print Pants page to be helpful. What ever style of pant you are wearing today is in fashion. If you want to be even more stylish, you should wear your Women's Animal Print Pants. Learn about other pant styles in our apparel terminology section.